Welcome to my annual appreciation-of-the-odd list. Wait. Isn’t gratitude against the law during an election year? Before I dine, I’ll lose the whine and savor what’s extra-fine. Join me, if you’re so inclined. First, I’m thankful the election is over. Enough said. 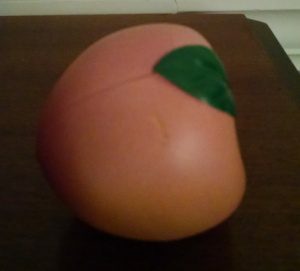 I’m thankful for my Pressure Peach, a squishy, foam rubber peach with a perfect blush. My sister, a weird, wonderful pastor who lives near Atlanta, hoped its therapy would keep me out of jail. Whenever I feel like punting my computer (or a few people I know), squeezing my Pressure Peach restores sanity and makes everything go just … peachy. I thank God for blue jeans that “go” with 1970s T-shirts, button-downs and blazers, sequins or satins. Accessorized with jungle flip-flops or jeweled high heels, jeans go everywhere with everybody. Stains customize their charm. Rips qualify them for designer status. Baggy, saggy or raggy, fitted or faded, yanked from dryer (or laundry hamper in an emergency), jeans are this girl’s best friend. I thank God pens, pencils and paper are still legal. I appreciate computers, especially since my handwriting rivals my two-year-old grandson’s. But my fingers still itch when I spy a freshly sharpened pencil, smell a new notebook, or watch ink flow like dark cream across fresh, untouched paper. I’m thankful gas prices dropped. Sigh. Now they’ll rise a dollar a gallon because I said it. Or because it’s Wednesday. Or because Obama ate anchovy pizza. Still, I’m thankful. I appreciate street lights. They remind me of Thanksgiving cooks — unnoticed until they take time off. I’m thankful for my naked coffee table. No one-of-a-kind knickknacks mar its surface — precious evidence of sticky little grandkid fingers. I’m thankful for my mantel clock, all crystal and gold balls that dance in an infinite circle. It keeps lousy time, despite fresh batteries. 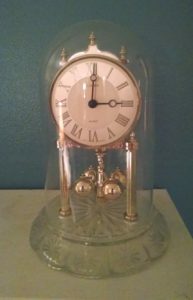 But my husband gave it to me one Christmas with a note that said his love for me was timeless. So I don’t mind being late to appointments. I’m grateful God didn’t outsource tree creation to me. I would have gotten the fall colors all wrong. I would have used Super-Glue to bind trunk, limbs and twigs in awkward lumps and would have forgotten roots. Winter breezes would have sent trees rolling like giant tumbleweeds, resulting in interesting insurance claims. God, however, engineers elaborate systems to anchor and nurture trees. With an artist’s eye, He arranges bare, elegant, black branches like lines of poetry. I’m doubly thankful God also welcomes the challenge of caring for me and other higher(?) species. Especially during this election year. What weird things make your odd-Thanksgiving list? This entry was posted in Coffee Corner, Uncategorized and tagged Autumn, Faith, Family, God, Holidays, Humor, Rachael O. Phillips, Thanksgiving on November 23, 2016 by rachael. Angie, SO thankful we are friends! I hope you and your amazing family had a blessed Thanksgiving! Yesterday I was in the grocery store picking up a few last-minute Thanksgiving things and found myself in the Maybelline products! On the bottom row, there it was, my go-to, and my mother’s go-to: black velvet eyebrow pencils, a two-pack, in the red stick. Inexpensive, effective. My mother used those all of my life and who knows how long before me. I’m 58. I thought to myself: Almost everything else changes and the different packaging and types of make-up have changed enormously through the years, but that simple product stays the same. I was grateful. I am grateful. Donna, I celebrate your gratitude! Whenever I find a shade of lipstick I like or the foundation that exactly matches my skin tones, I buy several, because I know within minutes, it seems, some innovative makeup executive will exile it to the Black Hole of the Outmoded, introducing a New and Improved version that loves wrinkles. I hope you and your family had an awesome Thanksgiving. Blessings on your Christmas shopping, and may Maybelline eyebrow pencils remain the same forever!